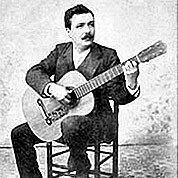 Rafael Marin was a talented guitarist and flamenco music composer. Born in Pedroso de la Sierra, Province of Sevilla, Spain, July 7, 1862. While very young he became an enthusiastic aficionado of the guitar and the flamenco music. Rafael Marin published a Flamenco Method book. “Methodo Para Guitarra- Aires Andaluces“. A bible for many flamenco artists like Ramon Montoya.